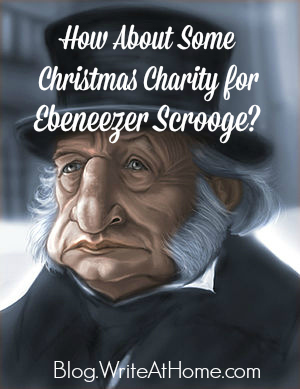 Home / Blog / How About Some Christmas Charity for Ebeneezer Scrooge? My favorite Christmas story is Dicken’s “A Christmas Carol.” I particularly look forward to my annual viewing of the movie featuring George C. Scott. It is a heart-warming story of redemption and transformation. People think I kid when I say that I want to be more like Scrooge each Christmas. I really mean it. I want to be the Scrooge who sends an enormous Turkey to the Cratchet family and gives shocking whispered sums to the poor and doubles Bob Cratchet’s salary and becomes a second father to Tiny Tim. I want to be ” as good a friend, as good a master, and as good a man, as the good old city knew, or any other good old city, town, or borough, in the good old world.” How has this man’s name become anathema? Christmas-morning Scrooge is an inspiration and a literary role model if there ever was one. Let’s honor his miraculous transformation and stop slandering the poor fellow! And God bless us, every one! I’d love to read your comments. Leave them below. Is “Xmas” Part of a War on Christmas? What Exactly Did the Little Lord Jesus Do with His Head? I love this movie, but enjoy watching the original with Alastair Sim. Forgive my pronouns. They are my downfall. I agree. In our city’s annual six-week Christmas Traditions festival, Scrooge becomes converted on Christmas Eve, greeting the crowds with a heart “Merry Christmas!” Perhaps sooner, ideally?